I was shocked — SHOCKED I tell you — to open the editing panel for Markings and discover that up until today I had posted here only three times in 2017. I knew it had been very few, but only three? I marked my journalversary, but ignored my birthday (I turned 70). I did a lot of the usual things: writing, enjoying my grandson, going to Vermont (twice) and North Carolina. But I didn’t have the inclination to write about it publicly. Something was amiss, some short circuit in my ability to concentrate, to follow through on the ambitious plans I made for my life. Long story short (as they say): I saw my cardiologist in October, a new one because the one who treated me in 2015 has retired. In-office EKG looks good, he said, but let’s get a good look at that murmur (a kaploosh kaploosh sound instead of the steady click CLICK that a normal heart is supposed to give off). (Note: these are not the medical terms.) I was sent for an echocardiogram. 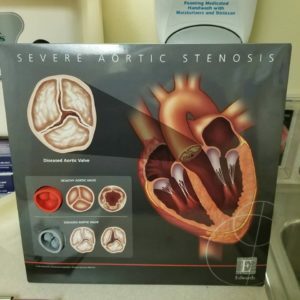 The finding: I have severe aortic valve stenosis. Remedy: get a new valve. The red circle is a pliable disk meant to resemble a healthy aortic valve. The gnarly gray circle, stiff and coarse, represents my valve. The drawing of the heart suggests that I am actually getting a new head gasket. Next week I have one more test, then a decision will be made about which method will be used to install the head gasket: either a surgical procedure done with minimal invasion (still called “open heart surgery” although they don’t crack your chest, and the recovery is only 3 weeks or so) or a really minimally invasive approach similar to the way my stents were placed (recovery a few days). This could happen before Christmas (the minimally invasive way) or not till April for the open heart, because the surgeon’s schedule is full. As I left the hospital, my Fitbit buzzed insistently. I looked down to see its face dancing with tiny digital fireworks. “You’ve reached your goal of 5000 steps!” I’d walked myself from the building where the cheery and enthusiastic Structural Heart Program team had seen me to the main hospital where I had a CAT scan with IV contrast on the fifth floor, then a pulmonary function test on the fourth floor. And it wasn’t even 12:30. I spent the rest of the afternoon figuring out what is essential to make a Merry Christmas (crèche, Advent wreath, St. Lucy’s Day cardamom rolls), and what events and appointments can be shifted easily should the need arise. I’m optimistic and full of forward motion. I’m ready to Jingle All the Way. Come with me. Happy Holidailies!